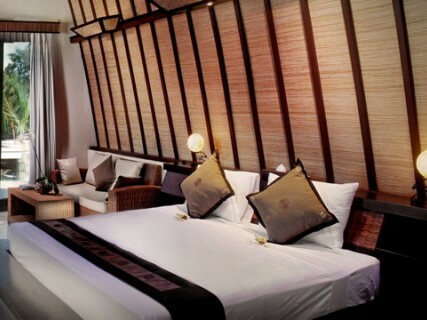 Hotel Vila Ombak is the first international hotel on the magical island of Gili Trawangan, a 10-minute boat ride off the north western coast of the main island of Lombok, a small exotic tropical island. The Hotel features 150 air-conditioned rooms and bungalows fully equipped with mini bar, refrigerator, coffee and tea maker, satellite TV, telephone and large semi-open bathrooms. Hotel facilities include the Warong Bule, a budget restaurant with a sea view offering a mixed menu of Mediterranean Indonesian food supported with full wi-fi coverage. Other dining options include The Sea Horse Restaurant, Side Walk Café, Blue Bar and Island Pool Bar where guests can try sweet coconut water by the swimming pool. The hotel also has its own diving academy, the only dive centre in Indonesia to receive an award for "Outstanding Commitment for the PADI system of education". It is a fully accredited 5 Star Dive Centre and Gold Palm Resort.